A lovely dinner dressed in your finest followed by an evening of live theatre performance is always a highlight of a trip to Melbourne. Coming up ballet lovers can enjoy the romance of Giselle, the raw power of Spartacus or the magical antics of A Midsummer Night’s Dream. For fans of musical theatre, Madiba The Musical and School of Rock The Musical are both running from October. For a truly operatic night out, Opera Australia has upcoming performances of Metamorphsis, La Bohème and Die Meistersinger von Nürnberg throughout October and November. Melbourne comes alive during the Spring Racing Carnival as fashion meets racing during this premier series of events during November. The Melbourne Cup is the showcase event as the entire city shuts downs for the day and all eyes turn to Flemington. Race 7 at 3pm is the pivotal race of the carnival where the top jockeys and horses from all over the world race for the richest prize in Australian sport. Viewers at the track watch on in spellbound anticipation as commentators guide us through the most electric 3,200 metres in sport. When planning a visit during the Melbourne Cup Carnival make sure to purchase tickets in advance online and then start the enjoyable process of putting together the perfect outfit. Some of the ticketed areas at Flemington Racecourse have a set dress code however no matter where you are it is generally expected that guests frock up (or suit up) when attending the races and for ladies a statement headpiece or hat is also a crucial part of the ensemble. Getting to Flemington Racecourse from InterContinental Melbourne The Rialto is easy either by catching a taxi from right outside or taking a short stroll down to Southern Cross Station and taking a short train ride to the station right at the track. Derby Day at Flemington Race Course is the opening event of the Spring Racing Carnival and is traditionally the day when race goers wear black and white. The Fashions on the Field competition begins on this day as Melbourne’s best-dressed strut their stuff. The feature race of the day is the Group 1 AAMI Victoria Derby boasting prize money of over $1 million. The Melbourne Cup is undoubtedly the most prestigious day in Australian horse racing and the key event of the Spring Racing Carnival. More than 100,000 people will flock to Flemington and eyes from all over the world will turn to Melbourne. Fashions around the track tend to be brighter and more daring, reflected by the colourful official flower of the day which is a yellow rose. Oaks Day is Ladies Day at the races and the day to style your outfits in a distinctly feminine fashion. 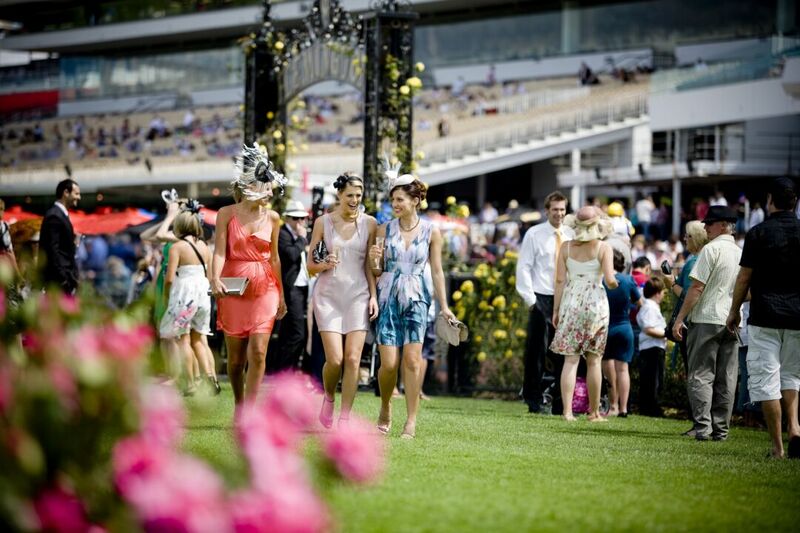 Spend the day at the track with your girlfriends, champagne in hand enjoying the spectacle and perhaps flaunting your style during Fashions on the Field. The racing highlight of the day is the Group 1 Kennedy Oaks, a classic for three-year-old fillies over 2500m. The final day of the Carnival is known locally as family day. Fashions are more relaxed and understated and the mood is of celebration and enjoying the weekend. Activities and live entertainment for children headline the off-track while on the track the Group 1 Darley Classic and the unforgettable weight-for-age Group 1 LKS Mackinnon Stakes are the star events of the day. So much to love in Melbourne this spring. Book before September 25 to receive free breakfast and at least 25% off. Read more here. Flemington Spring Racing – 2011 Mark Chew, image courtesay of Visit Victoria.